We met with our little ball of energy, Landon, twice this week and everything is lining up great for his baptism. We were able to actually push his baptism up a week so it will be on the 8th! We're finalizing the service this week, and we're pumped! Something we didn't really expect this transfer is all these miracles with finding all these young studs who want to be baptized. We were going through our area book and list of families in the ward and we felt like we should stop by this new family that moved in about a month ago. They moved here all the way from Liberia! Long story short, we met with the grandma and her two grand kids and had a wonderful lesson on how families can be eternal through God's plan of happiness. Afterwards, the 10-year-old grandson enthusiastically tells us, "Oh! And I want to be baptized!" We said, "Well, we can sure help you out with that!" Haha. He was wearing a Steph Curry jersey and told us all about how he loves basketball, lol what a bro. The Lord definitely led us to that family, and we had no idea that would happen! We're seeing them again this week. What a great experience! We had dinner at our ward mission leader's house this week and had an interesting meal - Peanut Butter and Jelly Omelets! Now, I was a skeptic at first. Seems like such a bizarre combo right? But man, surprisingly it was SO good! We also saw Kevin again this week, he's still reading and progressing well. He showed us his house out in the country and gave us a little tour of his ranch. Got some videos of these cool rams he has! He is still hesitant to set a date for baptism, but we were able to commit him to pray about a date in November. But some good news, he came to a session of general conference with us which he loved! I'll wrap up with one of my favorite talks from conference - President Nelson! 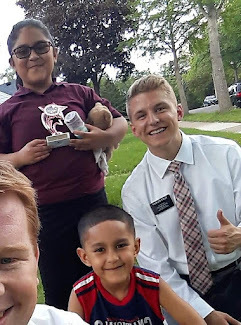 His talk was pretty much a recap of what he spoke about to us during our mission-conference back in April and it was amazing! He asks the question, "What would you lose if you didn't have the Book of Mormon?" There are so many amazing examples, and doctrines, and insights to God's eternal plan for us. I think for me, the biggest thing we would lose is the strength of our testimony of the divinity of Jesus Christ. Because the Book of Mormon truly is another testament of Christ that not only reaffirms the message of Christ in the Bible, but draws us even closer to Him through the peaceful spirit that it brings, it truly is the keystone of our religion! I know it's true. I hope you all have a wonderful week. Remember that God loves you and is always aware of your needs! Keep moving forward. I love you guys!